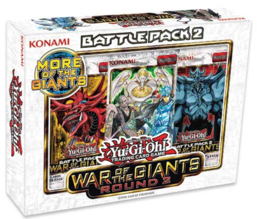 War of the Giants: Round 2 is an expansion pack, designed specifically to be used in combination with Battle Pack 2: War of the Giants to adapt the latter for the Draft environment. It was only released in North America; its European equivalent is War of the Giants Reinforcements, which includes 1 extra card ("Zubaba General"). Supplements the original Battle Pack 2 with monster removal effects, Spell/Trap removal effects, and single-Tribute monsters, all of which were previously scarce. Includes a "bonus" Ultra Rare card per pack excluded from drafting. The cards from Battle Pack 2 can also be found in the box, but are not part of this named set. This page was last edited on 13 September 2018, at 04:28.